Before I do any redistribution, I would like to verify that my ACLs are working correctly. To do so, on R3 and R2 I use the command show ip route list (ACL) followed by the ACL name like RIP-NATIVE or OSPF-NATIVE. All routes have their respective route either directly connected or using their native routing protocol. Now I can configure mutual redistribution on R2. Let me do a quick check of my routing table to see if all routes are being learn nativelly. First R2 and then R3. … I see that now this route has an AD of 110 instead of 120 as previously, which is the reason why R3 is not learning any RIP route. R2 redistributes RIP to OSPF, R3 install only the OSPF routes because cause of the lower AD of 110. The quickest and easiest way to fix this problem is to apply a distance command on R3 that lowers the AD of RIP routes to something below OSPF 110. In our example I’ll use 109 for all neighbors using the previous defined ACL RIP-NATIVE. All RIP native routes are learn through RIP on R3. If you configure mutual redistribution on R3 make sure to apply the same distance command on R2 to prevent this same problem. 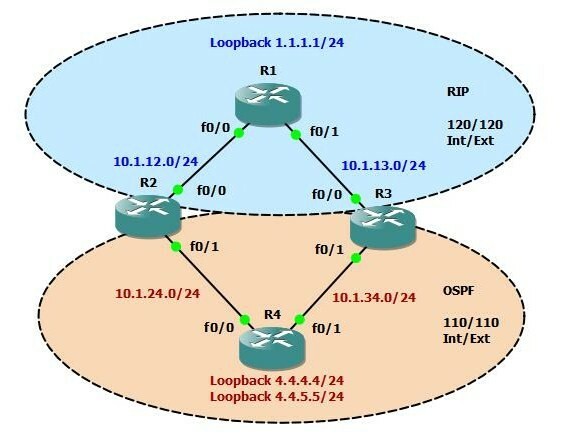 Hopefully with this example I was able to show you a good methodology of how to prevent problems when redistributing RIP and OSPF that could be applied to a bigger and more complex redistribution problem in the lab.